By July 1986, Gordon Lightfoot was one of the most successful Canadian musicians of his generation, and was preparing to release his seventeenth album East Of Midnight, which was his first album in three years. Gordon Lightfoot was hoping that East Of Midnight would prove more successful than his previous album Salute, which was released in July 1983, and stalled at 175 in the US Billboard 200 and fifty-nine in the Canadian RPM. Salute was Gordon Lightfoot’s least successful album since he released The Way I Feel in 1968. Since then, Gordon Lightfoot had become one of Canada’s most successful musical exports, and in America, his 1970 album Sit Down Young Stranger and 1978s Endless Wire were certified gold, while 1974s Sundown and 1976s Summertime Dream both sold over a million copies and were certified platinum. The seventies were the most successful period of Gordon Lightfoot’s three decade career in America. It was a similar case across the border in his homeland. In Canada, Gordon Lightfoot was one of the country’s most successful singer-songwriters during the seventies. Four of his albums topped the Canadian RPM chart, and his 1976 album Summertime Dream was certified platinum. There was also the small matter of sixteen Juno Awards, which were Canadian music’s most prestigious awards. 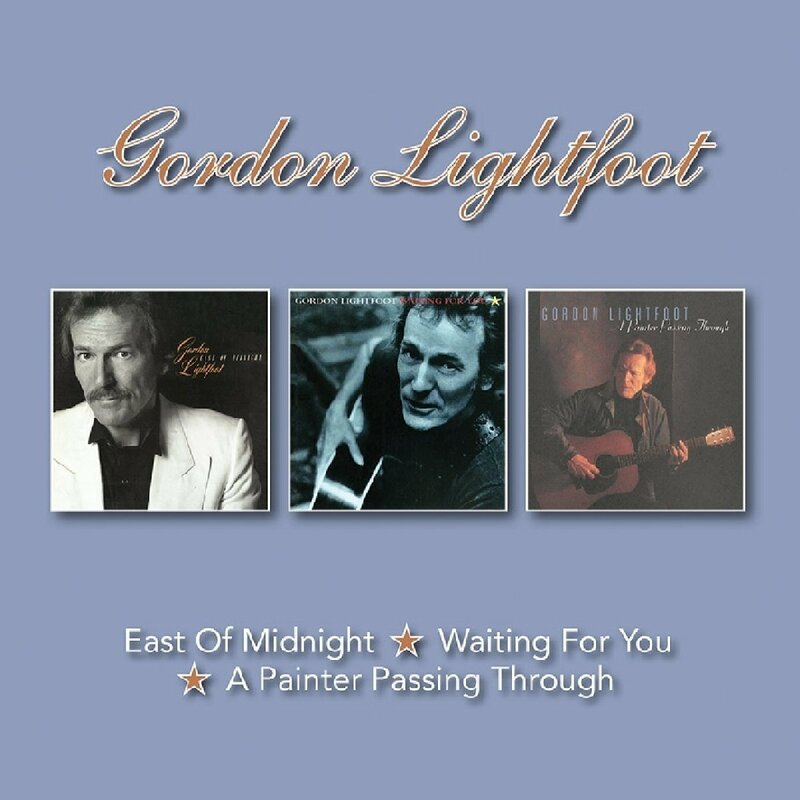 Gordon Lightfoot was one of the legends of Canadian music, and was hoping that East Of Midnight which was reissued alongside Waiting For You and A Painter Passing Through as a two CD set by BGO Records, would transform his fortunes, and get his glittering career back on track. After the disappointing sales of his previous albums Salute, Gordon Lightfoot began writing the songs that became East Of Midnight in 1984. After writing nine new songs, he joined forces with keyboardist and producer David Foster and penned Anything for Love. It became part of East Of Midnight which was recorded during 1985 and 1986. Recording of East Of Midnight took place during January, June and December 1985 and during March 1986 at Eastern Sound, Toronto, Lionshare Recorders and Lighthouse Recorders, in Los Angeles. Over this four-month period, more than a dozen musicians played their part in the recording of East Of Midnight, including some familiar faces including keyboardist David Foster, guitarist Michael Landau, percussionist Lenny Castro and Vesta Williams and Richard Marx who both added harmonies. Meanwhile, Gordon Lightfoot played guitar, added vocals and took charge of production, apart from Anything for Love which was co-produced by David Foster who cowrote the song. It would later play an important part in the success of East Of Midnight. Once Gordon Lightfoot had finished recording East Of Midnight in March 1986, Warner Bros Records scheduled the release of the album for July 1986. Before that, critics had their say on what was the first album that Gordon Lightfoot had recorded in four years. This was the longest he had been away from the studio, and critics were keen to hear his comeback album East Of Midnight. Troubadour Gordon Lightfoot made a welcome return on East Of Midnight, and makes an impression straight away on the album opener the ballad Stay Loose. Morning Glory and the album closer I’ll Tag Along are both ballads, but feature understated arrangements that hark back to Gordon Lightfoot’s albums from the seventies. Ballads seem to be what he does best on East Of Midnight, and proof of that are East Of Midnight, A Lesson In Love and the Anything In Love which are carefully crafted songs with polished arrangement. Just like many albums recorded during the second half of the eighties, Gordon Lightfoot makes good use of the new technology. Synths are used on many songs, and effectively on the ballads Let It Ride and A Passing Ship. Meanwhile, the drums on Ecstasy Made Easy and You Just Gotta Be have an unmistakable eighties sound, as Gordon Lightfoot’s vocals play a starring role on his comeback album East Of Midnight. After receiving favourable reviews from critics, Anything for Love was released as the lead single and reached thirteen on the Adult Contemporary chart and seventy-one on US Country charts. When East Of Midnight was released in July 1986, it stalled at 166 in the US Billboard 200 and in the Canadian RPM reached thirty-seven. However, this was enough for a gold disc in Canada, and Gordon Lightfoot was back or was he? East Of Midnight was very nearly Gordon Lightfoot’s swan-song, and he went as far as to say that he wouldn’t record another album. It looked like the end of a long and successful career. However, by 1992, Gordon Lightfoot had had a change of heart and began work on Waiting For You. Just like East Of Midnight, Gordon Lightfoot wrote nine of the ten songs on his Waiting For You. The other song was a cover of Bob Dylan’s Ring Them Bells. These song became Gordon Lightfoot’s eighteenth album Waiting For You. In March 1992, Gordon Lightfoot and his small, but talented band headed to Eastern Sound, in Toronto. The band featured a rhythm section of drummer and percussionist Barry Keane and bassist Rick Haynes who were augmented by lead guitarist Terry Clements and keyboardist Mike Heffernan. Gordon Lightfoot played guitar and took charge of vocals and production, and by the end of March 1992, Waiting For You was complete. Waiting For You was also a return to form from Gordon Lightfoot who was free from his addictions, and recorded his finest album since the seventies. Gordon Lightfoot was rolling back the years on an album where he revisited his old folk pop and folk rock sound on a very different album. Synths are used sparingly in contrast to Gordon Lightfoot’s last couple of albums. Gordon Lightfoot’s small, tight and talented band become yin to Gordon Lightfoot’s yang on Waiting For You. That was the case on the album opener Restless which features a captivating vocal on the string drenched ballad that is rich in imagery. This gives way to a powerful cover of Bob Dylan’s Ring Them Bells before the brisk and memorable folk rock of Fading Away. Only Love Would Know which features a soul-baring vocal, before the tempo increases on the beautiful ballads Welcome To Try and I’ll Prove My Love which features Gordon Lightfoot at his best. Wild Strawberries harks back to the music on Gordon Lightfoot’s early seventies albums while the hooks hadn’t been spared on I’d Rather Press On which had single written all over it. Ironic describes the album closer Drink Yer Glasses Empty, because by 1992 Gordon Lightfoot had beaten his demons and finally had gotten himself sober after years of carousing drinking his glass empty. However, the song closes Gordon Lightfoot’s finest album since the late-seventies. Critics agreed, and there were high hopes for Gordon Lightfoot’s eighteenth album Waiting For You. Sadly, the album failed to trouble the US Billboard 200, but reached twenty-four in the Canadian RPM chart. For Gordon Lightfoot the commercial failure of Waiting For You was a huge blow, and he wouldn’t return with another album until A Painter Passing Through in 1998. Three years after the release of Waiting For You, Gordon Lightfoot decided that it was time to return to the studio and record his nineteenth album, which became A Painter Passing Through. By then, Gordon Lightfoot had written eight new songs and had decided to cover Steve McEown’s I Used To Be A Country Singer and Ian Tyson’s Red Velvet. These songs became part of A Painter Passing Through which was recorded during 1996 and 1997 at Grant Avenue Studio, Hamilton, Canada. Before Gordon Lightfoot entered the studio, he had made his mind up that A Painter Passing Through would be a live studio album. He was trying to replicate one of his live shows, with a new album of material. This was a first for Gordon Lightfoot, but he was joined by his a rhythm section of drummer and percussionist Barry Keane and bassist Rick Haynes who were augmented by lead guitarist Terry Clements and keyboardist Mike Heffernan. They were joined over the next two years by a variety of musicians. This included guitarists Bill Dillon, Wendell Ferguson and John Lewis while Doug Johnson played dobro, pedal steel and steel guitar. Meanwhile, Pee Wee Charles played pedal and steel guitar while Willie P. Bennett harmonica and Daniel Lanois laid down some guitar and mando-guitar parts. Despite his track record as a producer, Daniel Lanois left Bob Doidge and Gordon Lightfoot to co-produce Painter Passing Through, which was completed in 1997. 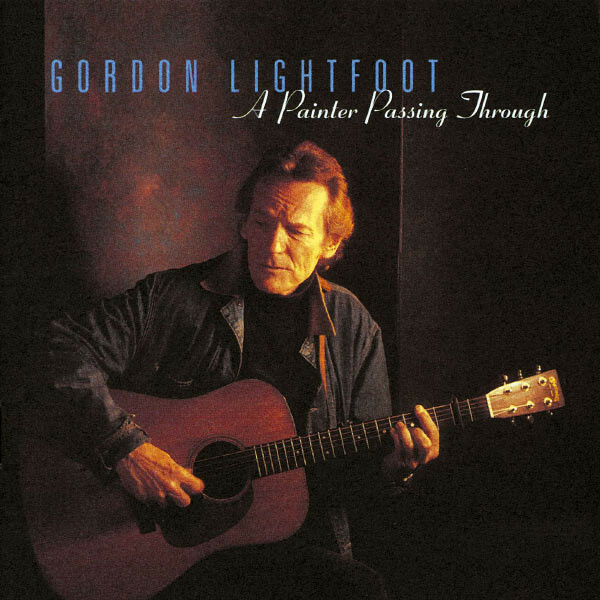 The following year, 1998, Reprise Records were preparing to release A Painter Passing Through, which was another return to form from Gordon Lightfoot as he switched between folk and country during this ten song set. It opens with the mid-tempo and melodic country-tinged song Drifters, which gives way to the ballads My Little Love and Ringneck Loon. Very different is the cinematic country rock of I Used To Be A Country Singer, where Gordon Lightfoot sings of life on road, and just like Boathouse it’s rich in imagery. One of the album’s highlights is the beautiful ballad Much To My Surprise, before Gordon Lightfoot paints pictures on A Painter Passing Through and On Yonge Street. It’s followed by the cantering country ballad Red Velvet, before the ballad Uncle Toad Said closes A Painter Passing Through, which was released forty years after Gordon Lightfoot made his musical debut in 1998. Sadly Gordon Lightfoot wasn’t celebrating when A Painter Passing Through failed to trouble the US Billboard 200 and stalled at ninety-two in the Canadian RPM. This was hugely disappointing for Gordon Lightfoot, and was a far cry from the seventies when he was one of the most successful Canadian recording artists. It was changed days indeed. After the release of A Painter Passing Through in 1998, it was six years before Gordon Lightfoot returned with his twentieth studio album Harmony in May 2004. It reached thirteen on the Canadian RPM and became his most successful album since Dream Street Rose in 1980. 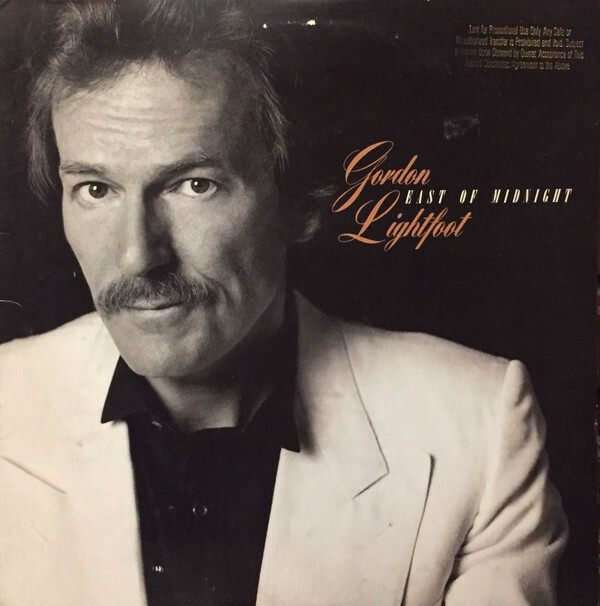 Sadly, Gordon Lightfoot hasn’t returned with a followup to Harmony, and his only release since then was All Live in April 2012, which reached sixteen on the Canadian RPM. Six years later, and seventy-nine year old Gordon Lightfoot is still remembered as one of the greatest singer-songwriters that Canada has produced. Gordon Lightfoot is remembered for songs of the quality of If You Could Read My Mind, Sundown, Carefree Highway, Rainy Day People and The Wreck of The Edmund Fitzgerald. However, there’s much more to Gordon Lightfoot than that. This includes the twenty studio albums he released between 1966 and 2006, including East Of Midnight, Waiting For You and A Painter Passing Through which was recently remastered and reissued as a two CD set by BGO Records. Although these albums weren’t the most successful of Gordon Lightfoot’s long and illustrious career, they’re underrated albums that are well worth discovering. This starts with 1986s East Of Midnight which was certified gold in Canada, is a slick, polished album that has eighties production values where Gordon Lightfoot at his best on the ballads. 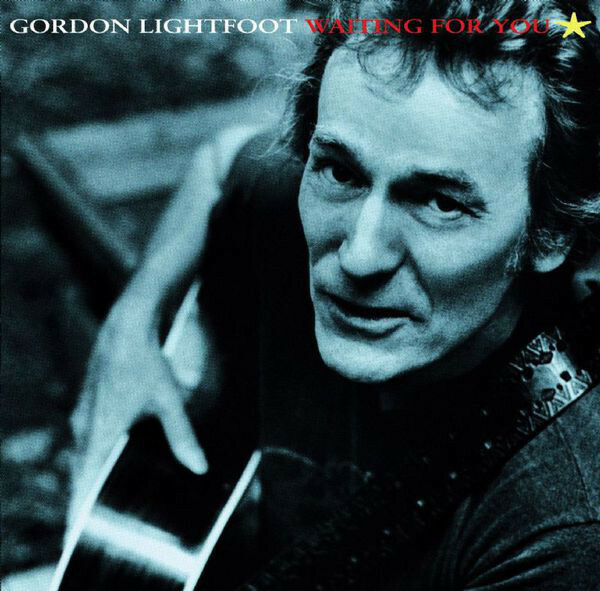 The followup Waiting For You was released seven years later in 1993 and was Gordon Lightfoot’s finest album since the late seventies. The final album in the trilogy is A Painter Passing Through where Gordon Lightfoot seamlessly switches between and combines elements of country and folk. These three oft-overlooked albums East Of Midnight, Waiting For You and A Painter, are a reminder of one of Canadian music’s great singer-songwriters and most successful musical exports.